The current Apple Mac Pro, released in 2013, is a strong favourite amongst Creative Professionals due to its impressive specification. The Mac Pro remains a favourite for many people in the industry, however people’s opinion of the once angelic Apple Mac Pro are being tainted and eyes are beginning to look towards the world of HP ‘Z’ series Workstations. The Apple Mac Pro seems to have caused its own downfall due to outdated technology and less options to expand due to its small size. So, it seems one of the key selling points of the Mac Pro has come back to haunt Apple. At HardSoft Computers, we have noticed the demand for HP Workstations is on the rise and the Apple Mac Pro seems to be getting pushed to one side. Will Apple allow HP Workstations to take over, or is it already too late for the Apple Mac Pro? 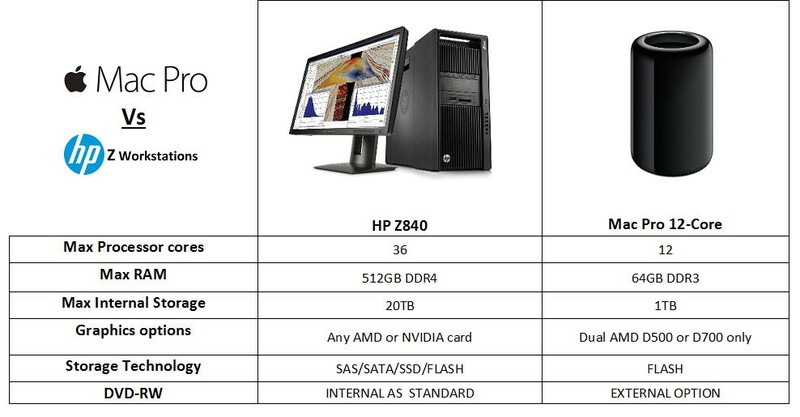 HP Workstations, particularly the HP Z840 Workstations, have a better maximum specification than the Apple Mac Pro. The HP Z840 can feature a massive 36 cores with the latest Intel Xeon V3 processors whereas the Apple Mac Pro only has a maximum of 16 cores that are still using the outdated Intel Xeon V2 processors. The HP Z840 Workstation features an incredible 20TB maximum storage, available in multiple technologies whereas the Mac Pro is a long way off that and requires further costs for external storage devices. So it’s clear to see why creative professionals are edging towards the HP Workstations as HP are using the latest processor chip-sets from Intel and they have many, many more options to expand the configuration. At HardSoft Computers, we are expecting an update from Apple regarding the Mac Pro soon. The ‘Spring Forward’ announcement from Apple, made no mention of any update to the Apple Mac Pro. Having been released in June 2013, the Mac Pro could be getting an update later on this year but Apple have a lot to squeeze into the small body to keep up with their HP competitors. Could we see a change to the appearance of the Mac Pro? We are not sure but it’s hard to imagine Apple bringing out a sub-standard machine. With no room to expand the current Mac Pro, Apple have to do something to increase processing cores, RAM and storage capacity; all the features they are falling behind on compared to HP Workstations. When it comes to cost, comparatively, the HP Workstations are cheaper than the Mac Pro which is what you would expect from Apple but the HP Workstations aren’t cheap either! Based on an identical specification, HardSoft Computers can lease the Apple Mac Pro 12-Core with 6GB graphics for £62.15 per week. Included in all of HardSoft Computers pricing is a full 3 year warranty, telephone technical support, an onsite engineer if required, upgrade options after just 2 years and a freebie option with any new lease. If you compare the Mac Pro to a HP Z840 Workstation with the same specification but 8GB graphics, the lease cost would be £55.60 per week. So, the HP Workstations are a cheaper option overall but both the Apple Mac Pro and HP Z840 Workstation are expensive machines, especially when you consider the cost of a display and any extras you need on top of the machine. If I had to choose a machine, I would personally go for the HP Z Workstations, at the moment, as they have more options to configure and expand. The usage of all IT equipment is growing, the data we are using is getting bigger and there’s more of it! I wouldn’t want to limit myself to a fixed configuration, just in case I out-grew the machine and required a new one. However, if Apple release a new Mac Pro with more options to configure, then i would have to contemplate this option. That’s where HardSoft Computers come in! We offer both the Apple Mac Pro and the HP Workstations on a flexi-lease, allowing you to spread costs over 3 years and have the option to upgrade to the latest technology after just 2 years of your lease. Feel free to contact our Sales Team on 0207 111 1643 for more information on leasing or further information on Graphic Workstations. 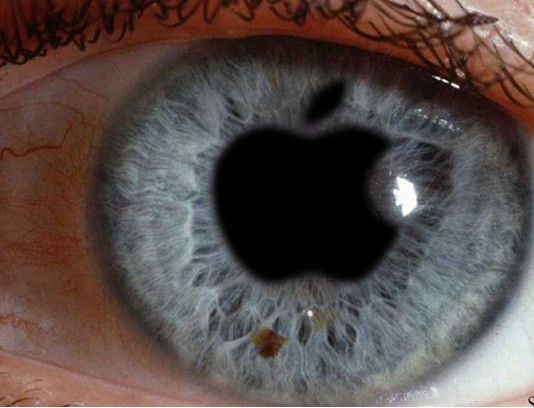 HardSoft are Apple Authorised Reseller and an HP Authorised Reseller- we’re not biased !